Patriotism or Fascism or Something in Between? A law was recently upheld in Nebraska establishing a mandatory period during the school day which will be devoted to reciting the United States of America's pledge-of-allegiance. Albeit mandatory, students are provided the option to abstain from actively participating. However, they must observe the mandatory pledge period in silence. Is this obligatory recital a benign form of collective patriotism or is it representative of state sanctioned paramilitary propaganda on line with the Young Pioneers of the former USSR? When we consider the litany of American patriotic symbolism there are some unavoidable icons in that arsenal. Symbols like the affable Uncle Sam with his red white an blue tuxedo with tails and a stovepipe hat are emblematic of America throughout the world. The Statue of Liberty amid Liberty Island in the New York Harbor stands as an anchor to the American ideology of hope and fortune. As witnessed at the Olympic Games recently in London, the American Flag and American's corresponding national anthem help to define the elusive concept of Americanism. Those moments are when the ethnically and culturally diverse nooks of America are able to collectively participate in a benign form of patriotism. Americans engage in a national catharsis as the flag is hoisted into the rafters and the orchestra begins the first notes of the Star Spangled Banner. Regardless of the symbolism employed or by which country, these are all forms of propaganda which engender national identity and a sense of otherness. The American pledge-of-allegiance is just another tool to propagate a unique and divergent national identity from others. However, the pledge-of-allegiance is rife with constitutional infringements and misguided ethical protocols. The pledge-of-allegiance has not been with us since the inception of the flag which was purportedly sewn together by Betsy Ross. The pledge was originally drafted by the Baptist minister Francis Bellamy in 1892 to commemorate the 400th anniversary of Christopher Columbus' landfall in the Americas. As part of the National Public-School Celebration of Columbus Day the pledge was intended for children to recite and was published in the then popular magazine “The Youths Companion”. The pledge was finally officially adopted by Congress in 1942 as the world was at war and America's entrance into the fray looked imminent. However, the US Supreme Court ruled in 1943 that public schools could not make reciting the pledge-of-allegiance compulsory to their students. The pledge-of-allegiance as it exists today has been an evolutionary process which has seen it undergo ideologically distinctive changes. The most significant alteration came in 1954 with the adoption of “under God” in the congressionally mandated verses. In 1951 the words “under God” were added by The Knights of Columbus which is coincidentally the worlds largest Catholic fraternal organization. A strange and befitting irony that in 1954 “God” would be attached to American patriotism as the country was fully embroiled in the Red Scare communist witch hunt know today more pejoratively as McCarthyism. The case could be made that McCarthyism ran roughshod over the 1st Amendment of the US Constitution in much the same way the pledge-of-allegiance mandate is today. 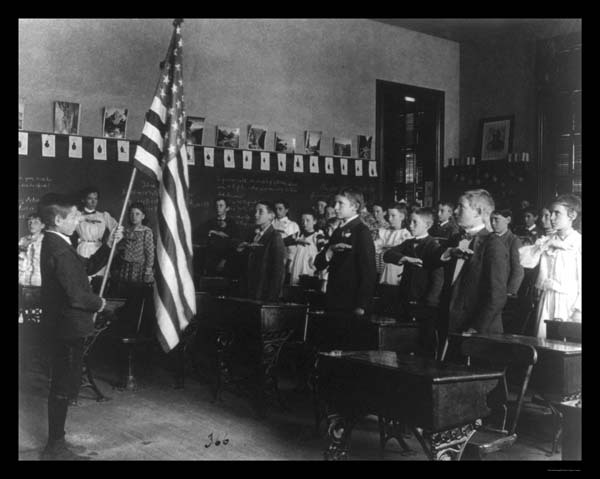 Many affirm that the mandate of school recitals of pledge-of-allegiance is tantamount to negation and circumvention of the the right to free speech. The constitution holds basic tenets of dissent in its allowance and protection of free speech to every citizen which would also logically include standing and silent observation. Notwithstanding the possible ridicule and demonization of school children who invoke their right to dissent by not participating in saying the pledge-of-allegiance, there is a more insidious moral infringement on children which 1stAmendment supporters adduce. Those who are most likely to recite the pledge most often (e.g. every day in public schools) are children. The advocates of 1st Amendment rights claim that these K-12 students shouldn't be subjected to honoring the obligations put forth in the pledge. Furthermore, they cannot realistically comprehend what the pledge entails so giving their consent to something they don't understand is on par with brainwashing. There must be a higher ethical code which doesn't manipulate children into subscribing to a myopic view of America patriotism while simultaneously aggrandizing a whole spectrum of American patriotism. Hopefully the US Supreme Court will be the next battleground between those in favor of the pledge-of-allegiance as it stands and advocates of upholding the integrity of 1st Amendment.